As Christine Blasey Ford testified against Supreme Court nominee Brett Kavanaugh in Washington D.C., recounting the details of her alleged sexual assault, the fourth day of the spring collections were taking place in Paris. 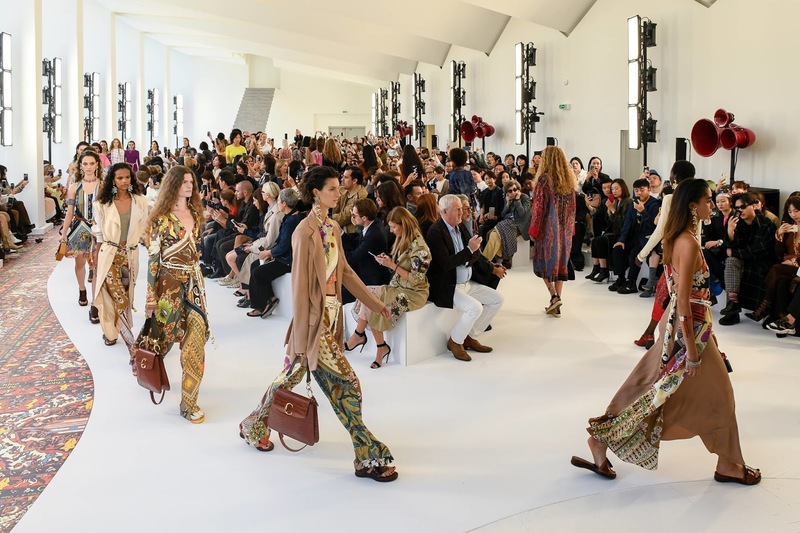 It never fails to feel out of touch to perch oneself in the front row and watch models swan past bedecked in next season’s stuff in times of socio-political tension. But the show must go on as inappropriate as it seems. On Tuesday, it was Belgian designer Dries van Noten’s turn. Van Noten, whose label was recently acquired by fashion and fragrance business Puig for an undisclosed sum, exhibited the freeing results of unbridled creativity in the wake of joining a luxury conglomerate. I interviewed Patrick Scallon for Glossy.co the other day, he was emphatic about defining the acquisition as a “strategic alliance.” The Puig acquisition is more of a collaboration, Scallon explained. It produced optimistic, coherent results for Van Noten who conflated athletic, workwear, and couture styles for the season ahead. This wasn’t couture, these were clothes. These weren’t just any clothes, though. They were soulfully bright, effervescent, and optimistic. Few compare and when you consider what’s going on right now in the realm of socio-politics, it takes someone like Van Noten to honour women with his tactile poetry and devotion to exploring fashion. At Chloé, Natacha Ramsay-Levi played it safe with an escapist attitude. She was thinking about Ibiza and Mykonos, Capri or the Balearics. Wheresoever the Chloé girl winds up she’ll be equipped with a myriad of summery options ranging from sunset-hued t-shirts with a feminist sign, fringed skirts, and paisley trousers. She threw some denim and light knitwear into the mix which was utterly gorgeous. Ramsay-Levi’s off to a good start at Chloé. She’s a talented woman with a flair for designing for their lives, but also according to the house codes: a bohemian spirit with a dash of sophistication. It’s collections like Chloé, despite their aesthetic value, that makes you scratch your head or release a sigh of relief. They bring to question the frivolity of fashion at a time when a woman is sitting in a hearing, recounting her side of the story, as the world watches on and judges. It’s collections like these that point to the subjectivity of fashion: you either value the escapism or you cast it aside, wishing someone would bother to reflect the times, offer their two cents on the world and how the women of tomorrow will respond. Leave it to Rick Owens to spell a statement so potent it resembles witchcraft, the kind of legal torture inflicted upon the victims rather than the accused, closely resembling the judicial strife taking place in America presently. Owens, an American, had a citadel erected at the Palais de Tokyo which was then torched, burning throughout the dramatic procession. He was thinking about nihilism, joy, resistance, anger, instinct, words achingly pertinent to the current state of American politics. 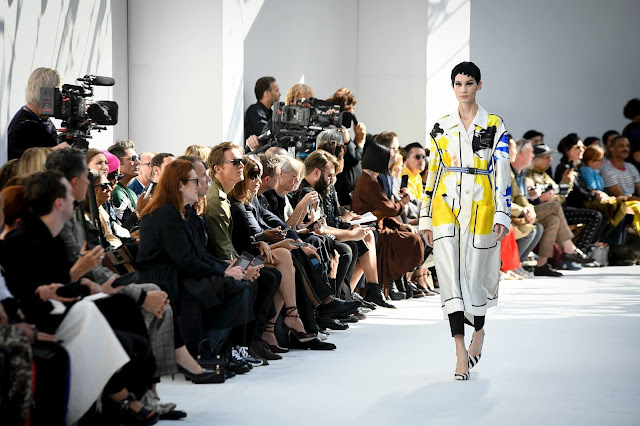 The collection borrowed the same inspiration from the men’s show in June, Tatlin’s Tower, a symbol of modernity but, ultimately, aspirational futurism. The building was planned to commence following the Bolshevik Revolution of 1917 but it was never realised. The clothes, if you want to call them that, were elaborate entities that could be described as ‘warrior insects.’ Much of it recalled the same Russian Constructivist notes that fed into the men’s show in June—harsh lines juxtaposed with curvilinear principles. He pieced together segments of leather into mini dresses resembling armour, denim was deconstructed and draped across the body echoing survivalist instincts, and geodesic monuments adorned models’ arms and heads like crowns. It was simply outstanding, the sheer unpredictability of it. Some of it was even wearable. Other parts were totally impractical. But Owens’ women have never been ones to waver to convention and it’s all the better for it. A torch-bearing woman blazed her own trail, attired in clothing whose aesthetic language belongs entirely to the designer who created it. It was poignant moment thinking about where the path might lead us but you need an authoritative figure, like Owens, and said model bearing a burning branch, to usher us out of a dark period and into brighter days. One hopes it’s a good omen.